There's a buzz in the weather community about the potential of heavy snow mid-late next week. Unfortunately, social media has already been littered with snow amounts that are outrageous this far out. It is important to note that there is still a lot of uncertainty and a lot could change between now that then. However, if you do have travel plans mid-late next week, keep up to date with latest weather information! "No significant changes to the forecast as confidence continues to increase a winter storm will impact much of the central U.S. in the days following Christmas. The best chance for heavy snow accumulations will be across the central and northern Plains to the Upper Midwest. A mix of rain and snow will be found near the low track, with rain and some thunderstorms to the south. It is important to keep up on the latest forecast if you plan to travel during this time." Storm System Still Nearly 3,000 Miles Away!! The wave of energy that has been forecasted to bring potential stormy weather across the Midwest is still located nearly 3,000 miles away; south of the Alutiean Islands. Yes, you heard that right! It is still nearly 3,000 MILES AWAY!!! With that said, weather models have been pretty consistent over the last few days showing this wave of energy deepening significantly over the Southwestern part of the country by the early-middle part of next week. 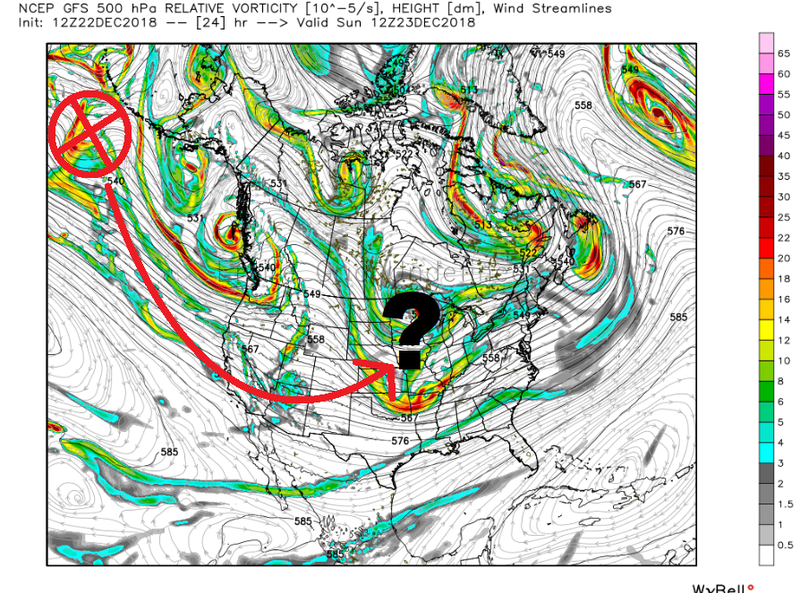 However, whatever happens after that is still very much in question as it approaches the Midwest. These details will continue to become more clear once the system finally gets on land in the Southwestern part of the country. "Are you dreaming of a white Christmas?" "Minnesota. Maine. Upstate New York. The Allegheny Mountains of Pennsylvania and West Virginia. Practically anywhere in Idaho. And of course, the Rockies or the Sierra Nevada Mountains. These are the parts of the Lower 48* where weather history suggests you want to be if you're looking for the best chance of a white Christmas. The map at right shows the historic probability of there being at least 1 inch of snow on the ground in the Lower 48 states on December 25 based on the latest (1981-2010) U.S. Climate Normals from NOAA's National Centers for Environmental Information (NCEI). The background map shows interpolated values for all locations. (Interpolating means estimating unknown values using known values and physical relationships, such as the way temperature is known to change with altitude.) You can also click and zoom in to specific stations used for the interpolation." 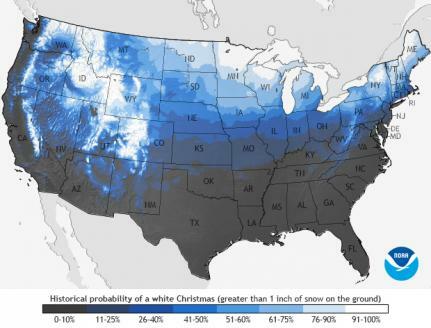 "Historical Chances of a White Christmas"
"Will we have a white Christmas? It's an age-old question that occurs to almost everyone this time of year. The chances of having a white Christmas vary even here in Minnesota. Having a white Christmas is loosely defined as having 1 inch of snow on the ground on Christmas Day. The snow depth at most sites is measured once a day, usually in the morning. The best chances of having a white Christmas is almost guaranteed in the Boundary Waters Canoe Area and a good part of the Arrowhead. The chances decrease to the south and west and the best chance for a "brown" Christmas is in far southwest Minnesota where chances are a little better than 60%. Northern Minnesota is one of the few non-alpine climates in the US where a white Christmas is almost a sure bet (U.S. White Christmas Probabilities )." "In 118 years of snow depth measurements in Twin Cities, a white Christmas happens about 72% of the time. From 1899 to 2017 there have been 34 years with either a "zero" or a "trace." The last time the Twin Cities has seen a brown Christmas was 2015. 2014 was also a "brown Christmas." The deepest snow cover on December 25th was in 1983 with a hefty 20 inches. It was also a very cold Christmas in 1983, with the high temperature of one (1) degree F. It was not the coldest Christmas Day in the Twin Cities. 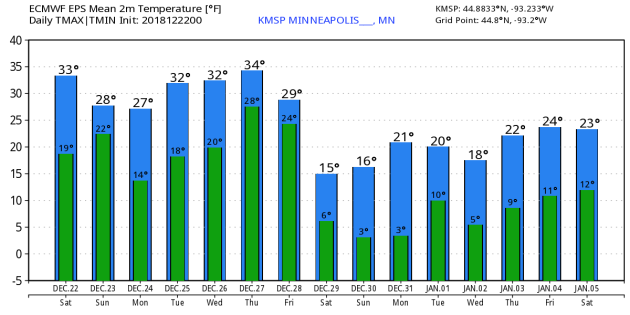 That dubious award goes to 1996 with a "high" temperature of 9 below zero F. The warmest Christmas Day in the Twin Cities was 51 degrees in 1922. There was not a white Christmas that year. In fact, the Minneapolis Weather Bureau log book for that day states that the day felt "spring-like." Here's the latest snow depth report across the region and note that the MSP Airport is reporting just a trace of snow on the ground. Note that in order to be a "white" Christmas, there has to be at least 1" of snow on the ground. Unfortunately, folks across much of Central MN hoping for a white Christmas won't get it this year as there is no snow in the forecast through Christmas day Tueseday. High temps across the state on Sunday will still be running a little above average for the mid/end part of December. Highs will warm into the 20s across much of the state, which will be at least a few degrees above average. A clipper system moving through the Arrowhead will continue to sag southeast through the Great Lakes on Sunday. Lingering light snow will continue in the northern part of the state and also across the northern half of Wisconsin. Snow accumulations will be fairly light. Lingering light snow will continue across the Arrowhead and northern Wisconsin on Sunday, but it will continue to remain quiet across much of the Upper Midwest through Christmas day. Good news for travelers heading to Grandma's house, however, mid-late week could get a little dicey as a storm system looks to develop and move into the Midwest. Stay tuned for further updates! 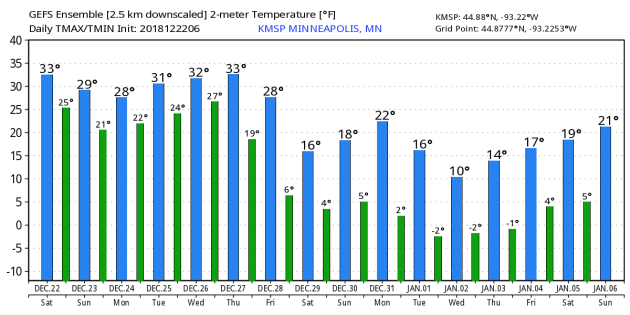 The average temperature in the Twin Cities is running nearly +5.5 degrees above average this month and it looks like temps will continue at above average levels through much of next week. However, we are getting indications of a bigger cool down during the last weekend of the month and into early 2019. According to NOAA's CPC, the extended temperature outlook from December 29th through January 4th suggests cooler than average temps working back into much of the Lower 48 with the exception of the East Coast. According to Pollen.com, the Cold and Flu forecast suggests that we will be running at medium to medium-high levels over the next few days. Wash your hands!! We rate everything these days, from our Uber rides to Yelp dinners and Amazon purchases. Wait, tornado intensity is rated (0 to 5 on the "EF-scale") and hurricanes go from Category 1 to 5, based primarily on wind speed and central pressure. Why not winter storms? Meteorologists in the Northeast have been ranking previous winter storms since 2003. NOAA is working on a new regional ranking scale for past winter storms (RSI) and now they're fine-tuning a Winter Storm Severity Index (WSSI) for future storms. It's a scale of 1-5, based on population, expected wind, temperature, snowfall, ice and expected impacts. With WSSI in mind, will the next big, sloppy southern storm moving into Minnesota Thursday and Friday be moderate, major or extreme? It's still early, and both track and expected amounts will shift over time, but this may wind up being a Category 3-4 winter storm, especially north/west of MSP, where 6 inches or more may pile up. No travel problems into Wednesday, but have a Plan B for late week. Whatever falls should stick around, with a numbing start to 2019. SUNDAY: Mostly cloudy and brisk. Winds: NW 10-15. High: 28. SUNDAY NIGHT: Mostly cloudy and quiet. Winds: WNW 5-10. Low: 18. MONDAY: Few sunny peeks. Still dry. Winds: S 5-10. High: 29. TUESDAY: Christmas coating of flurries. Winds: NE 5-10. Wake-up: 20. High: 30. WEDNESDAY: Dry much of day. Snow arrives at night. Winds: E 8-13. Wake-up: 24. High: 32. THURSDAY: Wet snow. Heavy at times. Winds: E 15-25. Wake-up: 28. High: 33. FRIDAY: Snow bands linger. May be plowable. Winds: N 15-25. Wake-up: 23. High: 26. SATURDAY: Flurries taper. Slow clearing and colder. Winds: NW 10-20. Wake-up: 26. High: 21. 1996: Heavy snow accumulates across much of southern and central Minnesota. Snowfall totals included 6 to 8 inches across the Twin Cities metro area, 10 inches in Jordan, 8 inches at Cambridge, Forest Lake, Hutchinson and Montevideo, and 6 inches at St. Cloud, Glenwood and Redwood Falls. 1983: The Twin Cities experience a bitterly cold high of 17 degrees below zero. 1833: A 'warm spell' is reported at Ft. Snelling. The temperature reached 45 degrees. "It's not hard to understand where the name of this moon comes from, as December is the month in which the winter cold fastens its grip on this part of the world. On occasion, this moon was also called the Moon Before Yule. Sometimes, this moon is referred to as the Full Long Nights Moon, which is appropriate because the winter solstice (the longest night of the year) occurs in December, and the moon is above the horizon for a long time. In December in the Northern Hemisphere, the full moon makes its highest arc across the sky because it's diametrically opposite to the low sun. In fact, the moment of the winter solstice comes just over 19 hours before this full moon, at 5:23 p.m. EST on Dec. 21. Peak fullness occurs at 11:49 p.m. CST"
"On December 23 and 24, 2018, the waning gibbous moon – just past the solstice full moon – passes to the south of the two brightest stars of the constellation Gemini. These two stars are noticeable for being bright and close together. In sky lore, they represent the starry eyes of twin brothers. One star is Castor, and the other is Pollux. On these nights, the moon is also passing to the north of Procyon, the Little Dog Star. As it goes full circle in front of the constellations of the zodiac, the moon swings in between the Gemini stars and Procyon once every sidereal month. But these stars aren’t always so well-placed for viewing as they are now! Click here for recommended almanacs that’ll tell you the rising time of the moon in your sky. And to find out the rising times for Castor, Pollux and Procyon (plus other bright stars)." I've always been interested the outdoors and how the change of seasons impacts the birds, plants and animals. I did a little research and found this great weekly segment by John Latimer (Phenologist), who reports on KAXE Radio out of Grand Rapids, MN. 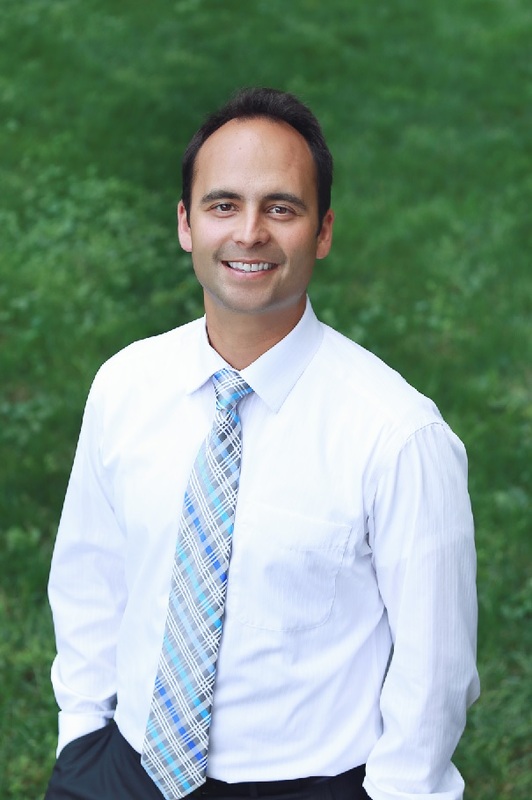 Great stuff John - keep up the good work!! This week: "Phenology Talkbacks and Student Reports: December 18, 2018"
High temps across the country will still be running above average across much of the nation with the exception of areas in Florida. If you're enjoying the 'milder' weather now, keep enjoying it because it looks like it'll start getting cold as we head into January. Weather conditions across much of the country will remain rather quiet through the early part of the week. There will be a little moisture that scoots through the Great Lakes and parts of the Northeast as we approach Christmas Eve and Christmas Day. A bigger storm looks to take shape across the Western part of the country as we head through the next few days. "What A Holiday Government Shutdown Means For U.S. Weather Activities"
"After the winter solstice, the number of daylight hours start to slowing increase. However, for federal employees, the days may seem long for another reason. I am a former federal employee. I worked for the National Aeronautics and Space Administration (NASA) for 12 years, and it was one of the best experiences of my career, except dealing with government shutdowns. They are petty, disruptive, and never really accomplish much. There have been 20 of them since 1976. Unfortunately as I type this, the nation is facing a holiday-season government shutdown. I find this one particularly disgusting because it is a time when many of us celebrate selflessness, charity, and love. With furloughs and loss of pay threatened, these actions are clearly acts of selfishness and smell of political tantrums. However, my focus herein is what a partial government shutdown means for weather operations, climate, and related sciences." "Deadly weather: the human cost of 2018's climate disasters – visual guide"
"Scientists say extreme weather events are getting worse as emissions rise and the planet warms. The UN’s recent alert that the world has at most 12 years to prevent climate catastrophe was a landmark moment. Never before has the threat of irreversible damage been so close. Starting now, massive cuts in man made emissions are essential if global warming is to be kept to 1.5C above pre-industrial levels by the end of this century. Even half a degree beyond that will significantly raise the risks of drought, floods, extreme heat and poverty for hundreds of millions of people, as well as dooming all the world’s coral reef systems and, probably, Arctic sea ice. Even now, at 1.1C of warming, the world’s climate is already entering dangerous territory. According to data from the Centre of Research on the Epidemiology of Disasters, in 2018 so far approximately 5,000 people have died and 28.9 million have needed emergency assistance or humanitarian aid because of extreme weather. Here is a global calendar of this year’s major disasters. Scientists say these types of event are becoming more frequent and intense as emissions rise and the planet heats up. The map shows the scale of the human impact, from January to the end of November." "Plants have a memory mechanism that could save them from climate change"
"Plants are not so different from us as they may seem. They get stressed and have memories, just like you and me. Their ability to remember the past tells them when conditions are right to blossom, and when it’s better to lie in wait. Now scientists have new insight into the mechanisms behind greenery’s memory—which may enable humans to develop strains of plants that can adapt to climate change. 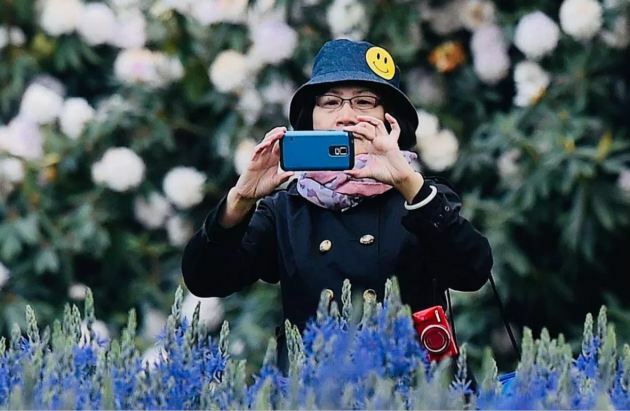 A new study in Nature Communications from researchers at the universities of Birmingham, Nottingham and Oxford in England and Utrecht University in the Netherlands explores the function of certain proteins that are key to flowering plants’ ability to survive and thrive. The researchers believe their findings have wider application beyond flowering plants specifically. The study could help lead to the creation of plant varieties of all kinds that are more environmentally sensitive and, as a result, more resilient under difficult, shifting conditions."